Our recently turned 15 year old daughter just returned from her first solo plane trip. She traveled across the country (non-stop, thank goodness!) all the way to New York City to stay a few days with family and then flew home again by herself. We are so proud of her, as she is of herself. She was just beaming when we picked her up at the airport. The confidence and competence needed to accomplish this milestone in her young life can only be learned by experience, and it has been our goal to teach these skills to our children through frequent travels since they were little. Letting them navigate through airports and train stations, read maps, ask locals for help, and gradually gain independence are some of the things we've tried to encourage. That's not to say I wasn't worried about her flying alone! Much to our daughter's disapproval (and teenage eye-rolling) we requested a gate pass to accompany her to the plane. (Sidebar here: United Airlines would only give us one gate pass, although we were two parents escorting our flying minor. What's up with that?? Would it have been such a great security risk to allow us both to go?) There were lots of a few tears from me as I watched her stroll down that jetway, but I can guarantee there was a fist pump from her as she turned the corner out of sight from me. We had had to promise not to meet her at the gate upon her arrival home, and I was comfortable enough with that, but I had grave concerns over her solo navigation of the evil alien world of JFK airport. Hustlers, and swindlers, and New Yorkers, for God's sake! But one of the many advantages kids these days have over young travelers of my generation is cell phones. Getting lost in a crowd and meeting place confusion just doesn't exist anymore. My daughter texted her cousin as soon as the plane hit the tarmac in New York and they found each other literally within minutes. And within the same minute, we received the text, almost 3000 miles away, that we could exhale, our baby was safe. She's even mastered the long-arm self-portrait! They had such a fabulous time together. It's an experience my daughter will never forget. And might I just mention that you can read a first-hand account of their action-packed days in the Big Apple, because this big city cousin of ours just happens to be the author of the top-rated NYC blog, baby meets city. Part 1 of their adventures is posted already, part 2 will be coming soon. Great fun! Labels: Inspiration, Planes Trains and Automobiles, Tips, U.S.
And NYC--my favorite in the whole world! So happy that she has mastered the (Julie Hibbard inspired) long-arm technique! It is the ONLY way to assure that you get really good pictures! My Parents were always great about exposing my siblings and I to travel at a very young age. I remember when I was about 15 I took my first solo flight as well. Unfortunately I wasn't able to go non-stop, but my parents had no concern because they knew that I had such a fascination with airports and airplanes that I probably new air travel better than the average adult. I am so glad that my parents exposed me to travel so young. I know that I've learned great travel patients that has helped me get some pretty nice perks during my travels. WAY TO GO! Great Post! P.S. 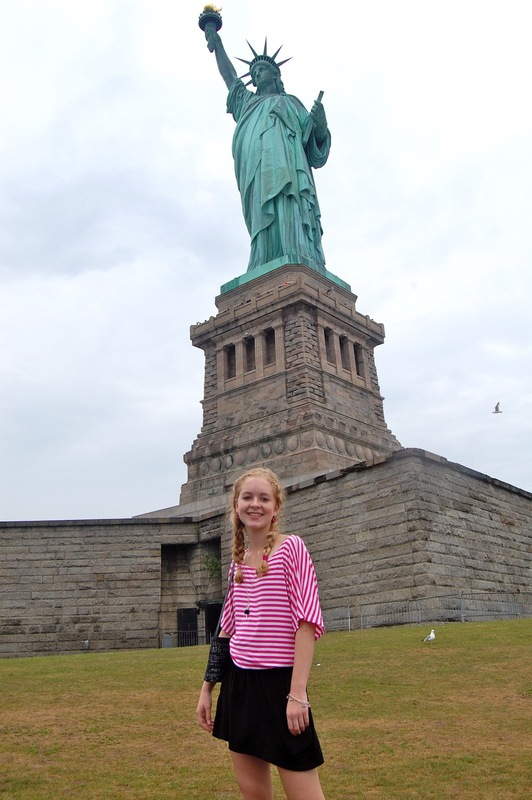 Thanks for showing me a great blog featuring NYC! You've done a good job,Mom by giving her the skills and the confidence to do all that. Way to go.